Ask The Ripped Dude: Are My Fitness Goals Achievable? Are your fitness goals achievable? Obi Obadike explains. My New Year's resolutions include a goal to get fit. I'm just not certain my goal is a good one! How can I tell? It's the New Year, which means men and women everywhere are searching for the magic pill, supplement, or workout that will quickly burn unwanted weight. Newsflash: There is no magic path to fitness. The only way to get there is to decide what you want to accomplish, set a specific goal, and do the work. Before you set your goals in stone, though, make sure they're concrete and achievable. Unfortunately, "get fit" doesn't fit the bill. Your fitness goals need to be specific, measurable, and achievable within a certain timeframe. I want to lose 16 pounds in 8 weeks. I want to decrease my mile time to 8 minutes in six weeks. I want to improve my 40-yard dash time by 0.4 seconds in 6 weeks. I want to increase my bench press by 20 pounds in 8 weeks. I want to reduce my waist by 3 inches in 6 weeks. I want to be able to do one set of 10 bodyweight pull-ups in 3 months. I want to be able to do one set of 40 continuous push-ups in one month. Each of these goals is measurable, which means you can keep track of the actual number you try to achieve. You can count pounds, reps, and inches, but you can't effectively count, "I want to get fit." Being able to measure a goal is essential to your success. If you can't, you'll never know if you progress and you'll never be able to tell if you need to make adjustments. Track your time, poundage, reps, and other variables relevant to your goals after each and every workout. The example goals above are also realistic and achievable. You know your body and your fitness level; you also know you are capable of improvement. Your realistic and achievable goals may not realistic or achievable for the person next to you. If you can't perform a single pull-up, then your goal "to do a set of 10" may take longer to achieve than the person who can already do five. Some people are born with a faster metabolism or great muscle-building genetics—it's your job to understand your strengths and weaknesses and manipulate them to aid your journey toward fitness. After making the decision to start, write down your goals and create an accountability network. Share your goals with friends, take progress pictures, break your overall goal into smaller milestones, and commit to assessing your progress every week. Make your goal public and totally commit. Then, find or create a diet and training program appropriate for your specific goal. For example, a weight-loss program won't have the same macronutrient ratio as a muscle-building program. 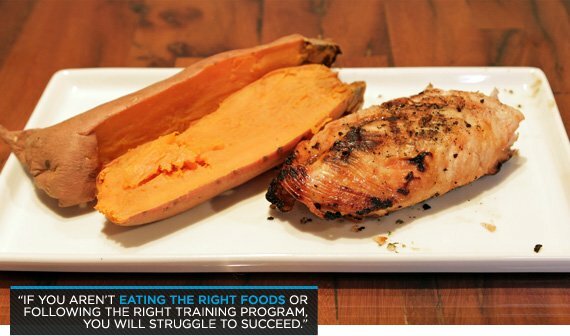 If you aren't eating the right foods or following the right training program, you will struggle to succeed. Nothing happens overnight. Once you find and implement a diet and training program, you should see yourself inch closer and closer to your fitness goal every week. Stay patient, dedicated, and consistent; don't change your training plan every day. Instead, stay the course. Before you know it, you will have changed your life.